To say that my question “Is this book pro-Hezbullah?” wasn’t well received on Tuesday night at SOAS is an understatement. I was at the book launch of The Hizbullah Phenomenon: Politics and Communication written by Lina Khatib, Dina Matar and Atef Alshaer. The book explains how Hizbullah has been successful in staying relevant since its 1982 inception by adapting itself to changing situations and communicating these adaptations through various means such as poetry and social media. Hizbullah are poets? Who knew. So, according to the authors, Hizbullah’s 1980s narrative was one of “victimisation” to attract Lebanon’s marginalised Shia Muslims. During the 1990s it was one of “resistance” against Israel and connection with “Palestine”. From 2000 onwards it was focused on “defence” after Israel had left south Lebanon with Hizbullah disseminating the narrative that the Lebanese army is not strong enough to defend Lebanon from Israel. Now Hizbullah is back to a “victimisation” theme after being implicated in the murder of former Lebanese Prime Minister Rafiq Hariri and others by the Special Tribunal for Lebanon and also due to its fighting alongside Bashar Assad in Syria. Dina Matar said that although Hasan Nasrallah has lost some credibility because of Syria he is still popular, and people in the Arab world listen out for his speeches. She said there’s a sense that Nasrallah is “just like us, he’s approachable, he speaks the language of the people, he’s funny, he jokes and he’s humble in appearance”. If this is true then it is a sad indictment on the Arab world that with Hasan Nasrallah complicit in the deaths of over 200,000 innocent Syrians he is still thought so highly of. Khatib lives in America. One might forgive Americans for thinking such a thing with the murder of 241 of their fellow citizens by Hizbullah in Beirut in 1983. And what about the 200,000 dead in Syria and Hizbullah’s attacks on the Israeli Embassy in Buenos Aeries in 1992 (29 dead) and on the AMIA builing in Buenos Aeries in 1994 (85 dead), the Burghas Airport bombing in Bulgaria in 2012 (6 dead) and Hasan Nasrallah, true to his word of going after Jews worldwide, is now targeting Jews in Peru. This book is worth reading (if you can stomach the 30 page chapter on Hizbullah poetry) but only with a view to finding out how a modern day Nazi group, totally funded by Iran, portraying itself as a positive force continues to hold a beautiful country like Lebanon to ransom while bringing death and destruction both to Lebanon’s citizens and to Syria all with the final objective of destroying Israel and the Jewish people that live there. Joel Beinin and John Chalcraft in discussion last Tuesday at LSE. 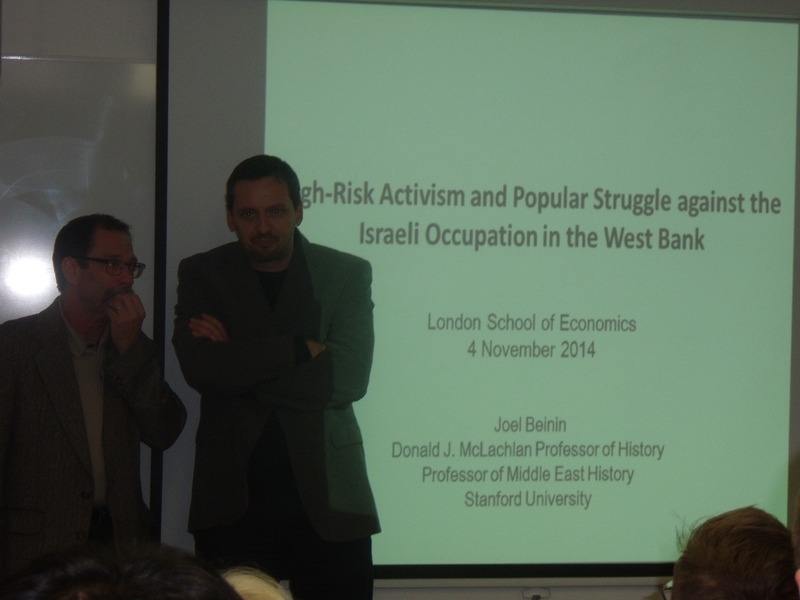 It must be November because because Joel Beinin, Professor of Middle East History at Stanford University, was in town. Last November Beinin was telling a SOAS audience that “Israel is heading into the abyss” and that Israel is putting Bedouin “into what would effectively be concentration camps”. Beinin’s talk was called High Risk Activism and the Popular Struggle Against the Israeli Occupation in the West Bank and was chaired by well-known Israel boycotter Dr John Chalcraft under the auspices of LSE’s Middle East Centre. The talk was mainly in support of Anarchists Against the Wall founded by Jonathan Pollak. It is a group of “anarchist Jews” who travel to Palestinian villages on the West Bank to join Palestinians protesting against Israel’s security wall in what they like to call “non-violent action”. Sometimes these Israelis get hurt in confrontations with IDF soldiers as when Gil Na’amati was apparently shot and injured. Unsurprisingly Beinin made no mention of why Israel built the wall. His talk was like a parallel universe in which suicide bombings had never happened, in which Hamas did not exist and where the International Solidarity Movement was a force for good in the world. When I raised this during the Q&A Beinin responded: “Had there not been that extremely harsh repression (by Israel) of the second Intifada there likely wouldn’t have been any suicide bombings”. LSE’s student audience lapped up all this nonsense with one of them thanking Beinin for giving a “very balanced talk”. The lecture theatre was full with 200 students. Meanwhile, the previous Tuesday I was at SOAS to hear William Mathew from the University of East Anglia give a talk under the auspices of the London Middle East Institute on British Policy and Arab Displacement in Palestine, 1915-23: Contingency, Imperialism, and Double-dealing. Mathew described a state of affairs leading up to the Balfour Declaration of powerless Arab delegates up against powerful and racist British diplomats and Zionist Jews in London. Despite the very strong current of anti-Semitism running through Britain’s political establishment Mathew said that Britain trusted European Jews more than the Arabs, who they “treated with contempt”, to defend Britain’s colonial interests in Suez and the trading routes to India. According to Mathew Chaim Weizmann described Arabs who came to London to lobby British diplomats as a “body of potential blackmailers and trash”. And Mathew went into detail about how, in his view, Britain had reneged on its promises in the McMahon-Hussein correspondence of 1915-16. During this Q&A I asked how, if Arab delegates were so powerless, did they manage to persuade world powers to carve trans-Jordan out of three-quarters of British Mandated Palestine? Mathew’s ridiculous response was “I don’t know”. So there you have it. Two talks given at two outwardly respectable organisations: The Middle East Centre at LSE and the London Middle East Institute at SOAS. Both speakers gave two completely different reasons for the rise of Israel: For Beinin it was the Holocaust, for Mathew it was all down to the powerlessness of Arabs pitted against powerfully racist Brits and Zionist Jews. And the theatre of hate continues apace. On Tuesday SOAS’ LMEI talk is about the “charismatic” Hassan Nasrallah. I kid you not. Now Amnesty International’s Kristyan Benedict compares Israel to Islamic State. “Louise Ellman, Robert Halfon and Luciana Berger walk into a bar…each orders a round of B52s … #Gaza”. Ellman, Halfon and Berger all happen to be Jewish. Amnesty’s subsequent disciplinary investigation found that tweet “ill-advised and had the potential to be offensive and inflammatory but was not racist or antisemitic”. Benedict was merely made to apologise. 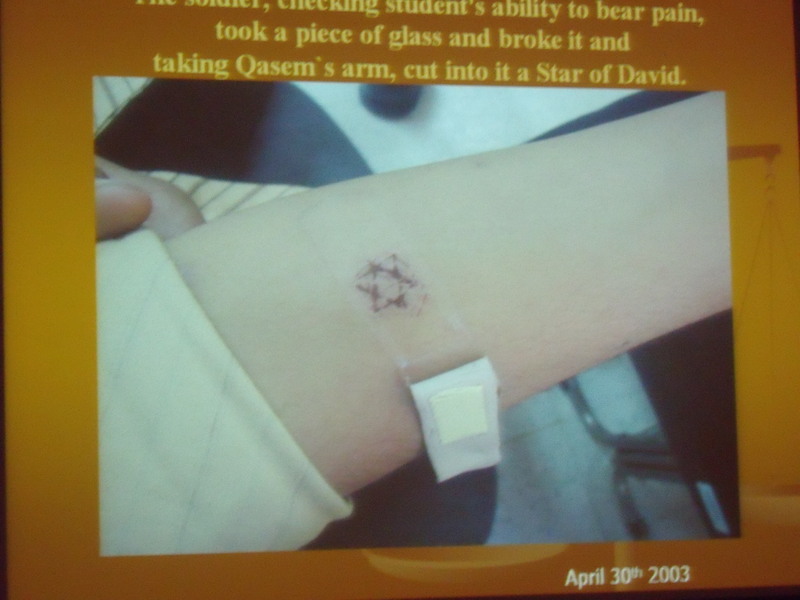 A year earlier Amnesty made Benedict apologise for physically threatening me after I questioned Benedict’s guest presenter Abu Dheer who produced to an Amnesty audience the following very possibly fake photo of a young Palestinian boy with a Star of David allegedly carved into his arm by an Israeli soldier using broken glass. Benedict called me a “war crimes denier” for questioning the photo and then threatened me physically. As you can see, the Star of David is too perfect to have been made by broken glass on a screaming boy’s arm and the plaster doesn’t cover the supposed wound properly. #JSIL means “Jewish State in the Levant”, a sickening comparison to the murderous ISIL. Obviously, not on any level can Israel be compared to Islamic State but in the prevailing febrile anti-Israel atmosphere Israel is now regularly being compared so alongside the usual comparisons to Nazism and apartheid South Afria. So this latest tweet by Benedict, sadly, comes as no surprise. Maybe Amnesty will carry out yet another investigation and make him apologise a third time. Who knows. But Amnesty does itself a disservice by continuing to employ Benedict. When considering his “JSIL” tweet, his B52 “joke” and his theatening behaviour in response to the questioning of that fake photo why would anyone seeking objectivity take seriously any report that Amnesty produces on the Israeli-Palestinian conflict?